Minuteman Press offers stability through a proven concept, even in the current economic conditions. As the economy slows, smart business owners increase their marketing and promotions, in order to grow their business. Our stores will offer many types of services to their customers to assist them in increasing sales. We will offer everything from business cards and brochures to full direct mail campaigns and promotional items. Large corporations will cut back on their in-house printing and utilize the services that Minuteman Press provides. Printing is a necessity that every business needs to exist. Our customers order products that are written on, dated, filed, thrown away and then it is ordered again. There is a tremendous repeat business in the printing industry. Aside from marketing materials, businesses will need printing for their daily business activities. Our stores offer envelopes, letterhead, rubber stamps, NCR forms, labels newsletters and much more. We encourage our owners to offer any business service their customers may need. By not limiting franchise services, it enables them to be truly full service and have stability in an uncertain economy. Our ongoing local support is the reason Minuteman Press has been ranked #1 time and time again by Entrepreneur Magazine. Minuteman Press has 27 strategically located support offices around the world. Each office provides on-site marketing, business management, and tech support. We also have regular local meetings and a worldwide convention with a large vendor show and various seminars where our owners are kept up to date on our industry trends. They also learn ways to improve their business no matter what their level of success. Minuteman Press' beginning was much more humble than its world renowned presence that exists today. Roy Titus, the Founder, saw a need for a print center that could serve virtually all businesses. With his son, Bob, they opened the first Minuteman Press in 1973 in Plainview, New York. They began franchising Minuteman Press in 1975. Today, Minuteman Press is the largest and #1 rated print and graphics franchise in the world with over 975 locations. Imagine a business with every other business as your potential customer, and you have just imagined our business. All businesses large or small, from your small mom and pop operations to the large corporate businesses consume printed material on a daily basis. With our state of the art technology, proven marketing programs and 27 regional support offices we have been able to take quality people from all walks of life and provide them with the opportunity to secure their financial future while providing a great quality of life. Minuteman Press has numerous avenues of financing to assist people going into our business. We will assist in finding the right financing options for you; whether it is for the purchase of a new or existing business. Most franchises will sell you a franchise. Then it is up to you to find a location. At Minuteman Press we research areas of interest for you and bring possible good locations to your attention. We decide together on a location before you make a decision to buy a franchise. Interested parties must have at least $70,000 liquid capital available. 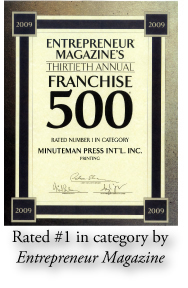 Click on Request Information for FREE info on how to open a Minuteman Press franchise today! Please Note: This Minuteman Press franchise opportunity and other franchise business opportunities, businesses and franchises for sale on this web site are not to be considered as an "offering", "franchise offering", suggestion or recommendation by Franchise Leader™. This advertisement depends entirely on the truthfulness of the information provided by our advertisers which includes, but is not limited to, franchisers, franchise brokers, franchise consultants and business brokers. Franchise Leader™ recommends that you consult a lawyer, financial consultant, accountant or professional advisor before buying a franchise or business opportunity or any type of business. By using this form or any part of our website, you have agreed to all terms and conditions of Franchise Leader™. Please review our Terms & Conditions for more information.